How do you want to play today? Gateway Green will offer many different types of experiences to locals and visitors, from a natural play area for the very youngest park goers to an advanced jump line within the bike skills area for advanced cyclists. The park is now open. Hours are from 7:00 am to 10:00 pm, every day except Friday when it opens late (10:30 am) due to weekly maintenance. For information on how to get to the park, check out Park Access. Gateway Green will be Portland’s first desginated bike park! The park will offer fun and challenging environments for all levels of riders - from youngsters just learning bike skills to advanced riders and racers. 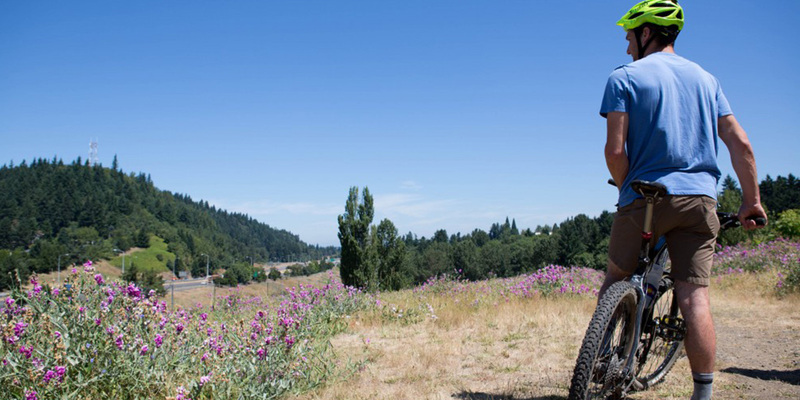 Included in the current design of the bike park will be multi-use paved trails, unpaved singletrack trails, a bike skills area, a gravity area, and a cyclocross course. We envision the site becoming a major focal point of the local off-road riding scene! Soft surface trails will wind through the site to allow for more intimate experience with the restored habitat. In addition, paved multi-use trails will allow people to access larger portions of the site and create regional connections to the existing 40-mile loop and future Sullivan’s Gulch Trail. Interpretative signage about the site’s habitat restoration, stormwater management, the volcanic origins of Rocky Butte and the effects of the ice age floods will provide passive environmental education opportunities. In addition, area schools and nonprofit groups will have access to the park for environmental curriculum. A field shelter will be built for picnicking and to provide a gathering space for classes and groups. As the habitat enhancements mature, there will be increasing opportunities to observe plants and wildlife. The nature play area will use natural materials to create a playground that stimulates children’s imaginations while teaching them about natural processes. Rocks, logs, sand, soil and plants will be integrated and available to be touched and manipulated. It will be located near the forested part of the site to take advantage of the existing and restored tree canopy allowing children to make their own adventures. Learn more about how you can help us develop the park here!